Radar technology is no longer just for the military, and is becoming an essential part of commercial automotive safety systems for automotive braking and collision avoidance. Operating at millimeter-wave frequencies (60 and 77 GHz) that were once considered more experimental than practical, modern automotive radar sensors must provide extremely high reliability while meeting the cost constraints of competitive commercial vehicular markets. In many cases, these high-frequency radar sensors are fabricated from hybrid printed-circuit-board (PCB) materials, where a number of dissimilar materials are combined to meet cost and performance goals. The choice of materials for millimeter-wave radar sensor hybrid PCBs can go a long way in attaining a set of performance requirements while holding the costs within range of automotive customers. For a hybrid PCB to achieve good reliability, several key material properties must be considered, including coefficient of thermal expansion (CTE), moisture absorption, thickness control, dielectric constant (Dk or εr) tolerance, and the thermal coefficient of Dk (TCDk). For frequencies to 77 GHz used for automotive radar sensors, even the type of glass weave used to reinforce a circuit material can play a part in performance and reliability. A material that has been broadly adopted for hybrid multilayer PCBs for automotive sensors at 77 GHz is the RO3003™ laminate from Rogers Corporation. There are many reasons for this adoption and it makes for a good study to evaluate this material with another contrasting material, to highlight the properties which are critical for these applications. For automotive radar sensors, the combination of materials in a hybrid PCB typically includes several layers of low-cost flame-retardant FR-4 circuit material with high glass transition temperature (Tg) and one layer of circuit material with characteristics well suited for use at higher frequencies. Such a combination of materials helps to control costs, maintain reliability, and still meet the electrical performance requirements of automotive radar sensors at frequencies through 77 GHz. High-Tg FR-4 circuit material is relatively low in cost (compared to high frequency circuit materials), generally has low CTE, and is capable of good plated-through-hole (PTH) reliability for dependable interconnections between circuit layers. The high-frequency circuit material, which is typically the outside layer of a multilayer hybrid circuit assembly, exhibits the properties needed for high performance at microwave and millimeter-wave frequencies. RO3003 circuit laminate from Rogers Corporation (www.rogerscorp.com) is an example of a material widely adopted as the high-frequency outer layer in hybrid circuit assemblies. CTE is a useful parameter for projecting the effects of temperature on a multilayer hybrid circuit assembly. The many different material layers within a hybrid multilayer PCB can experience stress at elevated temperatures and over wide operating temperature ranges. Different materials typically do not have similar CTE values in their three axes. When this is the case, as a hybrid circuit assembly heats and cools, the different circuit layers will expand and contract at different rates, resulting in stresses at the interfaces between different materials. When a hybrid circuit assembly is raised to the temperatures required for solder reflow, if the stress between material interfaces is excessive due to differences in CTE values for the different materials, delamination can occur between the circuit layers, causing circuit failures. The CTE of copper is about 17 ppm/°C and for a circuit material to have a similar CTE is ideal, so that the dimensional rates of change with temperature are similar. The general rule of thumb for CTE is that a circuit material should have a CTE of 60 ppm/°C or less. RO3003 circuit laminates, which have been adapted for many new 77-GHz automotive radar sensor applications, have CTE values of 17, 16, and 25 ppm/°C in the x, y, and z axes, respectively. The values in all three axes are closely matched to the CTE of copper for excellent reliability of PTHs and other circuit features at high temperatures and across wide temperature ranges. This three-axis CTE compatibility with copper is at least one reason why RO3003 laminates have been used so extensively in hybrid multilayer PCBs, especially for higher-frequency applications. The growth of applications at millimeter-wave frequencies—not just for automotive safety systems but also for backhaul links for mobile communications networks—has spurred the recent development of new circuit materials with mechanical and electrical characteristics suitable for these higher-frequency circuits. In addition to growing use in automotive electronic systems, millimeter-wave frequencies will be an important part of short distance communications links within different parts of emerging Fifth Generation (5G) wireless communications networks. Millimeter-wave frequencies of 30 GHz and higher provide the bandwidth needed for high data rates—bandwidth that has quickly been consumed at lower frequencies for many different wireless applications. At higher frequencies, however, signal power and stability is much more difficult to achieve and maintain, with much greater demands for high frequency circuit material performance than at lower frequencies. The RO3003 material has been widely accepted for millimeter-wave applications and can serve as a known reference for which circuit material qualities are needed for acceptable performance at millimeter-wave frequencies. Environmental conditions, such as relative humidity (RH), can alter the performance of even the most carefully designed PCB materials, especially at millimeter-wave frequencies. Moisture absorption is a circuit material parameter used to evaluate how a material will be affected by humidity and environmental moisture. Material suppliers generally use IPC test methods to determine how a material will respond to such effects, such as IPC-TM-650 2.6.2.1 used to measure the moisture absorption of RO3003 laminates, which is specified as 0.04%. Of course, data sheet values can vary, depending upon test methods and measurement approaches, and whether typical, minimum, or maximum values are specified. For example, when comparing RO3003 laminates to another circuit material with similar Dk value developed for millimeter-wave and hybrid PCBs, the data sheet value of moisture absorption for the other material—0.01%—is considered quite good. But when both materials were evaluated for moisture absorption by means of the same test methods, the value of moisture absorption for the second circuit material was found to be much higher. Another material parameter—dissipation factor (Df)—was found to deviate from the data sheet value of the second material as a result of changes in moisture absorption. 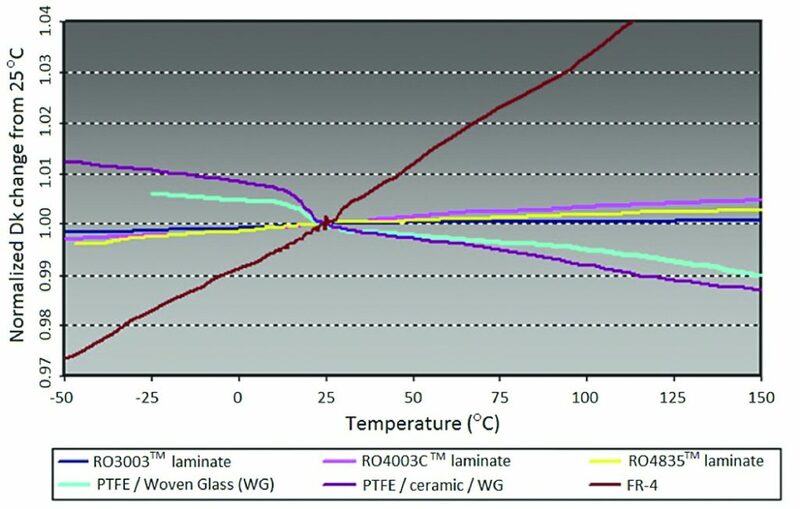 Table 1 compares RO3003 laminate and this second circuit material when tested under similar conditions. The baseline conditions for comparison consist of subjecting the materials to +23°C (approximately room temperature) and 50% relative humidity (RH) for 24 hours prior to testing. Both materials were evaluated for parameter values at 10 GHz using a clamped stripline resonator method per IPC Test Method IPC-TM-250 2.5.5.5c. As can be seen, Df increases significantly when a material has high moisture absorption. The conditions in the second row, for 24 hours exposure to +23°C water, are not realistic but are used to represent a worst-case scenario. The values in the third row, however, for 72 hours at +85°C and 85% RH, are common test conditions for evaluating circuit materials. Comparing the baseline conditions to the changes in performance brought about for the 72 hour test conditions shows an increase of 0.0021 in the Df of the first material. For RO3003 laminates tested under the same 72 hour conditions, the increase in Df is only 0.0004. Table 1 presents the moisture absorption values for the two materials, although change in Df as a function of change in moisture absorption is not a linear relationship. Circuit designers will note the slight differences in Dk in Table 1 for the two materials as a result of moisture absorption. To better understand the impact of moisture absorption on electrical performance at millimeter-wave frequencies, the two circuit materials were used to fabricate 50-Ω microstrip transmission lines for comparison. The simple circuits were tested to compare the insertion loss and dielectric constants of the two materials over a wide range of frequencies, including at millimeter-wave frequencies. 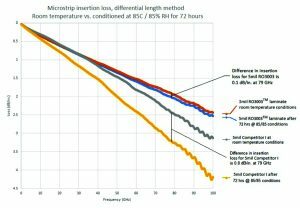 The results are shown in Figure 1, using the same baseline conditions as in Table 1 and then subjecting both materials to 72 hours of +85°C and 85% RH prior to testing the microstrip transmission lines. For both cases, 5-mil-thick circuit materials were used, and the differences in insertion loss at 79 GHz are quite apparent. The same test circuits and their 5-mil-thick materials were tested for the impact of moisture absorption on Dk over a wide range of frequencies, as shown in Figure 2. Both materials exhibit a steady decrease in Dk with frequency when tested through millimeter-wave frequencies. The RO3003 circuit material, with very low moisture absorption properties, shows very little change in Dk at millimeter-wave frequencies when subjected to 72 hours of +85°C and 85% RH prior to testing, a decrease of 0.005 in nominal Dk value at 79 GHz. The second material, with a somewhat lower Dk than RO3003 material, starting with the room temperature baseline conditions, suffers more significantly from the effects of moisture absorption on Dk, with a change of 0.040 in Dk at 79 GHz following 72 hours of +85°C and 85% RH. Both 5-mil-thick experimental transmission-line circuits were tested for Dk versus frequency across a broad range of frequencies using the microstrip differential phase length method. For each material, two microstrip circuits with different physical lengths are fabricated. The effective Dk of each circuit is determined from measurements of phase angles with a millimeter-wave vector network analyzer (VNA) and then, with the aid of a computer-aided-engineering (CAE) electromagnetic (EM) field solver, the Dk can be calculated for each frequency. The significant shift in Dk versus frequency in Figure 2 for the material with the higher moisture absorption is due to the change in phase response due to the change in water vapor absorbed into the circuit material due to moisture absorption. The control of Dk across a single circuit board and consistency from board to board is critical for maintaining consistent transmission-line impedance in any high-volume RF/microwave application. Similarly, the thickness of a circuit board plays a major role in controlling impedance, and the thickness must be tightly controlled for any high-volume applications. Especially at millimeter-wave frequencies as used for automotive radar sensors, where circuits must be extremely thin and consistent to minimize phase angle variations for accurate radar measurements, even small variations in thickness and/or Dk can result in large phase angle variations. Consistent Dk performance across a single circuit board and from board to board not only supports excellent circuit repeatability at microwave and millimeter-wave frequencies but also enables the use of commercial CAE simulation software for designing higher-frequency circuits and accurately predicting performance based on known, consistent Dk values. Consistent circuit-board Dk performance makes it possible to perform computer circuit simulations that closely match measured results on fabricated circuits, speeding the design process. A Dk tolerance of ±0.05 is considered quite good (RO3003 material features a Dk tolerance of ±0.04). When considering circuit materials for millimeter-wave applications, another important material parameter is TCDk. This is a measure of how much a material’s Dk will change as a function of temperature and ignoring other factors, such as moisture absorption. Ideally, a circuit material would have a TCDk of 0 ppm/°C, or no change in Dk as temperature changes. Realistically, the lowest possible values of TCDk are desirable to minimize variations in Dk with temperature. As an example, RO3003 laminate has a TCDk value of -3 ppm/°C, which is extremely low and less than 50 ppm/°C as an absolute value. It denotes minimal change in Dk with temperature, for stable electrical performance even when operating within the temperature extremes of automotive sensors. 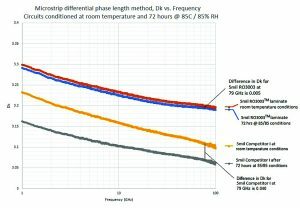 Figure 3 plots changes in Dk with temperature, relative to room temperature or +25°C and normalized to a value of 1.00, for a number of different circuit materials used for high-frequency applications, including RO3003 laminates and low-cost FR-4 materials often used in hybrid PCB circuits. As the curve for RO3003 laminate shows, this material remains extremely close to the nominal value of 1.00 from -50 to +150°C, which is due to the low TCDk value for this material. Because wavelengths are so small at millimeter-wave frequencies (decreasing in size with increasing frequency), the composition of circuit materials should be considered when choosing a circuit material for applications at millimeter-wave frequencies. Extremely small circuit features are needed in support of higher frequencies. For example, at 79 GHz and using a 5-mil-thick circuit material with Dk of about 3, a 50-Ω microstrip transmission line will have a wavelength of about 0.095 in. (2.413 mm). Circuit dimensions equal to a quarter wavelength at 79 GHz—0.024 in. (0.603 mm)—can cause unwanted resonances. Circuit materials employ different materials, such as woven glass, as reinforcement for added strength. Some circuit materials may employ glass cloth with physical features within the dimensional range of quarter wavelengths at millimeter-wave frequencies. These materials can suffer from this “glass weave effect” at millimeter-wave frequencies, with areas on the material that exhibit variations in Dk resulting in impedance and phase variations at millimeter-wave frequencies. This effect typically surfaces as circuit-to-circuit variations. For circuit materials employing glass reinforcement, the results of the glass weave effect can be difficult to characterize at millimeter-wave frequencies since they will depend upon the location and orientation of a particular circuit on the circuit material. Statistically, the number of circuit failures caused by the effect may be just a few out of a hundred. But in a high-volume application such as automotive radar sensors, with volumes reaching millions of sensors, a failure rate of just 2% can result in 20,000 defective sensors per million on the production line. The RO3003 circuit material is constructed without glass reinforcement, so there are no such concerns of variations in Dk and phase at millimeter-wave frequencies. However, most other high frequency laminates do use glass reinforcement and this can be a source of inconsistent phase response at millimeter-wave frequencies. The inconsistency can be difficult to characterize due to the alignment of the circuit features to the glass-weave pattern being somewhat random. Hybrid PCBs provide the means to cost-effectively combine high-performance circuit materials for millimeter-wave circuits, such as automotive radar sensors, with associated lower-frequency circuits, such as power supply and digital control circuitry. Automakers have discovered the value of pulsed millimeter-wave signals for forward- and reverse-looking collision avoidance systems, and hybrid circuitry has enabled circuit designers to deliver reliable, cost-effective solutions. The use of millimeter-wave frequencies will only increase with time, especially as 5G wireless communications systems are established and spread, and circuit designers will be well served to learn more about the various differences in PCB materials at millimeter-wave frequencies. We put together a quick reference table that helps with microwave PCB material selection based on application that can be found at our site below. It may help some engineers with material selection!